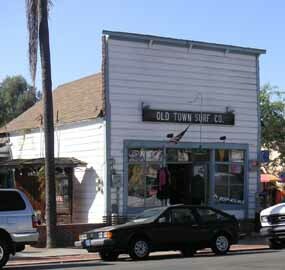 The central six blocks of Old Town are now Old Town San Diego State Historic Park. This walk covers the State Park, as well as the additional restored area just outside it. In addition to this walking tour, you might enjoy the one-hour walking tour within the park boundaries that is given daily by the Park Service. These tours leave from the Visitor Center, beside the Plaza, at 11 a.m. and 2 p.m., and from the Plaza del Pasado fountain at 12 noon and 3 p.m. Distance: A mile. Time: At least half a day. 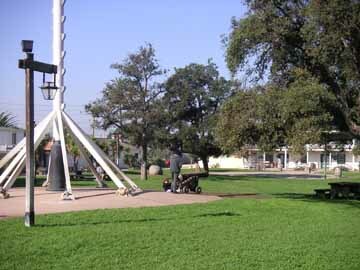 Our walk begins at the plaza, set aside as a public square by the Mexicans who planned the town. The main social center of Old Town, the plaza played host to bullfights, bull-and-bear fights, executions, fiestas, and other Spanish-Mexican public events. The plaza has been graced by several names, depending on which country had sovereignty over the town. For the Spanish, "plaza" was sufficient. When Mexico won its independence from Spain in 1821, the name became Plaza de Libertad ("Plaza of Liberty"). After the United States took over from Mexico, its name was changed to (what else?) Washington Square. Now it is again called simply "the plaza." 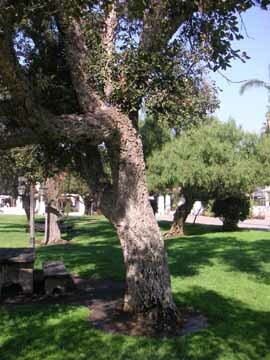 Several of the trees near the center of the plaza are cork oaks brought here from Portugal. The cork oaks are here as the result of an arrangement made between horticulturist Kate Sessions and the city of San Diego in 1892. The city allowed her to use thirty acres of Balboa Park for a nursery; in return, she agreed that each year she would plant 100 trees in the park and donate 300 more trees to be planted throughout the city. Most of the trees were grown from seeds, which she imported from all over the world -- Australia, Asia, South America, Spain, Portugal, Lower California, and New England. Go over to one and feel its corky bark. A cork oak lives from 300 to 400 years. After a tree is 20 to 30 years old, its bark can be stripped for cork once every ten years. As long as the stripper works carefully and does not bruise the tree, it will replenish its cork. Your first stop is the Visitor Center, on the northwest side of the plaza in the Robinson-Rose house. The highlight here is the HO scale model of Old Town showing the State Park area as it was in 1872. The builder of the models, Joseph Toigo, worked in the automobile industry as a body and fender man, and found the intricacy and delicacy of building models a welcome change of pace. When you come out of the Visitor Center, walk left, around the plaza. Passing the Plaza del Pasado and the El Fandango restaurant, you come to the Alvarado House, a reconstruction of the adobe home that was built here in the 1820's. Next to the Alvarado House is the Johnson House, a reconstructed frame house from the 1860's, now used as a shop. Continuing along the street, you next come to the former Cosmopolitan Hotel, now used as a restaurant. 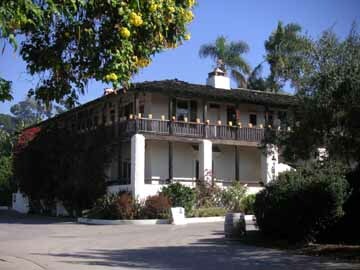 This was originally built as the home of ranchero Juan Bandini. 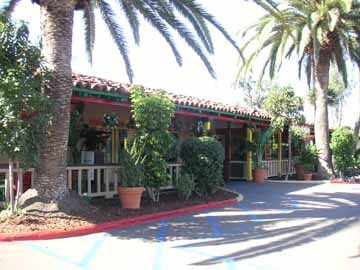 Completed in 1830, the original building was a one-story, U-shaped adobe. It was later converted into a hotel, and a second story was added. Walk to the left to the Blacksmith Shop and Woodshop, located on the site of stables built here in the 1860's. Return to the former Cosmopolitan Hotel and turn left. You soon come to the entrance to the Seeley Stable Museum. In 1867, Alfred Seeley began a stage coach line carrying mail and passengers between San Diego and Los Angeles. The business lasted into the 1890's, when the growth of the railroad caused its decline and demise. It was Seeley who purchased the Bandini home, added the second story you see today, and converted the home into the Cosmopolitan Hotel. It served as his San Diego depot, with the stables behind it. Today the stable contains wagons, stage coaches, and artifacts from the Old West. When you have finished here, walk back to the plaza to visit the Casa de Estudillo. The home of José Antonio Estudillo was built at the same time as that of Señor Bandini. Like Bandini, Estudillo's lifetime spanned Spanish, Mexican, and American rule. Under the Mexican regime he was, at various times, revenue collector, treasurer, and alcalde (mayor) of San Diego. When the Americans took over, he became treasurer and assessor for San Diego County. The Estudillos had eleven children, and various members of the family continued to occupy the house until 1887. Then the house came under the control of a "caretaker," who promptly proceeded to strip off and sell its furniture, tiles, locks, doors, and windows. What was left of the house was sold in 1905 to sugar magnate John D. Spreckels. Spreckels owned the streetcar line running down San Diego Avenue, and wished to attract more tourists to the area. He restored the home and named it "Ramona's Marriage Place," after the heroine of the enormously popular novel Ramona by Helen Hunt Jackson. The author supposedly based the character of Ramona on an adopted daughter of the Estudillo family. The restored home is among the highlights of your Old Town walk. The construction of the home is especially interesting. The roof is of curved red tiles. In the early days, before molds, the workman shaped a tile by spreading the soft clay on one thigh. As soon as the clay dried enough to hold its shape, he lifted the tile off, set it aside, and began another one. 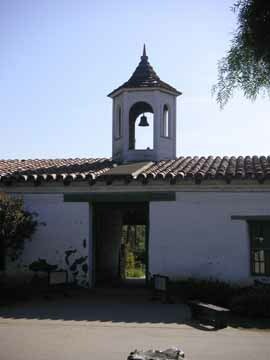 On top of his roof Estudillo built a cupola, so that he would have an excellent view of the events going on in the plaza. Whenever you pass through a doorway, notice that the adobe walls are two to four feet thick. Since adobe is not strong, thick walls are needed to support a heavy tile roof. Note how the beams of the ceilings are lashed together with strips of rawhide. In those days, hides were cheap and metal was dear. When you come out of the Casa de Estudillo, walk left, and then left again. 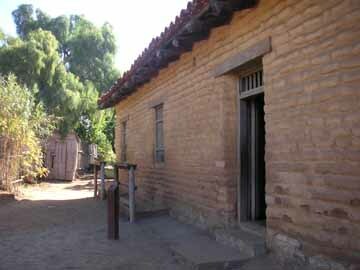 Just beyond the gardens of the Casa de Estudillo stands the last adobe built in Old Town, the 1868 Casa de Pedrorena. Miguel de Pedrorena was born to a prominent family in Madrid. His travels took him to England for an education at Oxford, then to Peru, and finally to San Diego as a supercargo, or shipping agent, of a coastal merchant ship. 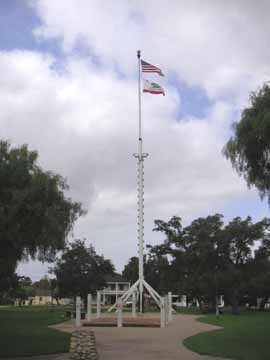 Once in San Diego, he married one of the daughters of Don José Estudillo, and added cattle-raising and two large ranchos to his business interests. This home was built by their son, Miguel, Jr.
Next door you will find Old Town's first frame building, which the Pedrorenas built in 1851 as a general store. Seventeen years later, two newcomers to San Diego used it to start a newspaper, The San Diego Union. After two years, the Union moved its offices to New Town, but in 1967 it reacquired the building and restored it to its 1868 condition. Inside you will discover the paraphernalia of early newspapermaking, as well as the office of the founders. Next to that is the Casa de Aguirre, a reconstruction of a home built in 1853. Resuming your walk, you leave the park and come to the Church of the Immaculate Conception, begun in 1868. Unfortunately, this was exactly the time that Horton's New Town was luring many Old Town parishioners to New Town. Building funds dried up, and the church was not completed until fifty years later. As you pass the church, on the other side of the street you will see a white wood building with blue trim and a false facade. It was once the home of attorney Jeff Gatewood, co-founder of The San Diego Union. 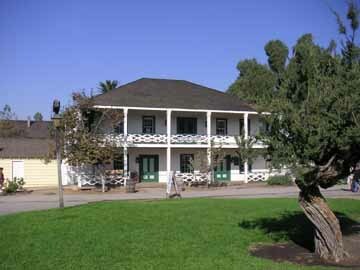 You stop next at Southern California's first two-story brick house, the Whaley House. 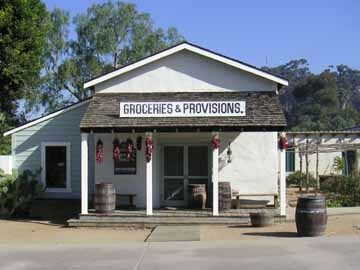 Thomas Whaley, a New England merchant, moved West to open general stores, first in San Francisco, and later in San Diego. He built this house for himself and his family in 1856. Its north room was originally a granary, but eventually Whaley remodeled it, and it became the County Courthouse in 1869. Two years later, a group who preferred that the courthouse be in New Town entered the house one night and took the county records. They transferred them uptown, where the records, and the courthouse, have remained ever since. The house is now restored and refurnished to the time it served both as County Courthouse and Whaley home. Continue along San Diego Avenue, and turn right on Conde Street. Half way down the block you will be standing in front of an adobe chapel. The building was constructed as a home in 1850. 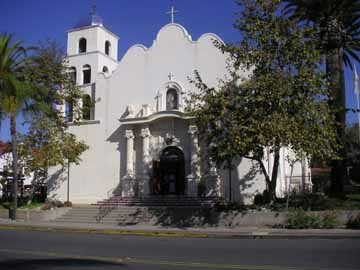 Eight years later, wealthy ranchero Don José Antonio Aguirre, in the midst of an important lawsuit, promised that if he won his suit he would provide Old Town with a church. He did win, and subsequently bought this adobe home and converted it into a chapel. For many years Father Antonio Ubach, who became Father Gaspara in the novel Ramona, was pastor here. Helen Hunt Jackson described this chapel as the site of the marriage of Ramona and Alessandro. Continue along Conde Street, and turn right when you reach Congress Street. After two blocks, turn left at Twiggs Street. At the end of Twiggs Street you will come to a reconstruction of the Casa de Lopez, now occupied by a restaurant. The original adobe was built in 1835 by Francisco Lopez. Lopez added rooms to the home as his family grew, and called it La Casa Larga ("The Long House"). Return to San Diego Avenue and turn left. Shortly you will come to the reconstruction of a 19th Century dentist and physician's office. At the end of the block, look across Mason Street to the Old Town General Store. In 1872 this is where the terrible fire started that gutted the major portion of commercial Old Town. Turn left at Mason Street. Part way down the block, you will see signs that direct you up a pathway to the Mason Street School. Before 1865 school classes met in various private homes. Then the citizens of Old Town built this one-room schoolhouse. Attendance averaged 35 students, from ages 4 to 17, in eight grades. Seven years later, the school was too small, and a larger, two-story one was built. The one-room building was moved to a new location to serve first as a home and then as a tamale factory. In 1946 it was about to be bulldozed to make way for a highway overpass when the San Diego Historical Days Association arranged to have it brought back to its original site and restored. 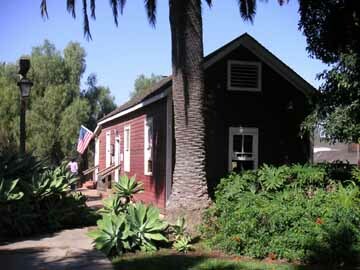 Go inside, sit down at one of the old desks, and let the docent tell you about San Diego County's first public schoolhouse, and Mary Chase Walker, its first teacher. Just beyond the school, enter a wooden palisade to the Machado-Stewart House. Don José Manuel Machado built this adobe home in 1835. Later it became the home of his daughter Rosa and her husband Jack Stewart. Jack had previously been a shipmate of Richard Henry Dana, who mentions him and a visit to the Stewart home in his classic book, Two Years Before the Mast. The home is now restored and refurnished. Behind the house is an outdoor cooking area, including an adobe oven. Return to San Diego Avenue by the path between the buildings. On your left is a reconstruction of San Diego's first courthouse. Built in 1847, it burned down in the fire of 1872. Adjacent to the courthouse is the Wells Fargo & Company History Museum. The prime artifact on display here is a restored stagecoach. Continuing down the block, the next building is the reconstructed Casa de Rodríguez, now used as a tobacco shop. The original one-story adobe was probably built in the early 1830's, and was also destroyed by the fire of 1872. Next to the Casa de Rodríguez is the Casa de Machado-Silvas, a home built about 1843. Today, the building is furnished as an early restaurant, in honor of a restaurant and saloon that opened here in 1854. Continuing along this side of San Diego Avenue, you come to three more reconstructed buildings. The first is the U. S. House, a prefabricated frame house brought here in the spring of 1850. It was owned by Charles Noell and John Hayes, who operated it as an auction house and provisions store. Next to the U. S. House are two adobe buildings. 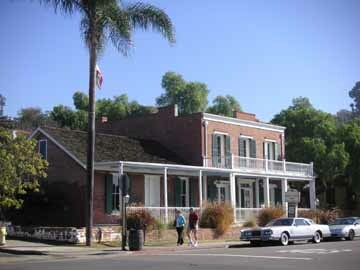 The San Diego House was built in the 1830's, and has been reconstructed to show how it looked in the late 1840's, when two free black men, Allen Light and Richard Freeman, used it for a provisions store and grog shop. Adjacent to it is the Machado-Wrightington House, once the home of Juana Machado Wrightington, another daughter of the Machado family, and her husband Thomas.